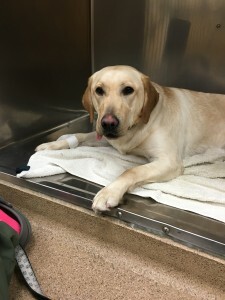 Ripley, a 1 year old female spayed Labrador Retriever, presented for an exam after owners had noted her to have protracted vomiting since the morning. She ate her breakfast and was interested in food but subsequently had vomited the ingested material. Owners believed that she may have ingested a needle that was on the counter but were unsure if this was truly the case. Ripley had also been hacking and appeared extremely uncomfortable when she swallowed. She is otherwise acting and drinking normally. On physical exam, Ripley had a dry, hacking, cough that was produced when her throat was palpated. She was also observed to display exaggerated swallowing actions. A complete oral exam was unable to be performed due to Ripley’s discomfort. The rest of the physical exam was within normal limits. 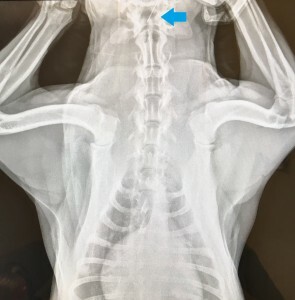 Recommended abdominal and cervical X-rays to determine if Ripley consumed the needle that the owners were missing from the counter and also to characterize the discomfort in her throat region. Owners consented. Cervical X-rays revealed a sewing needle lodged just in front of the epiglottis at the level of the hinge of the jaw. The rest of the X-rays were unremarkable. Discussed findings with the owners and recommended sedating Ripley in order for the foreign body to be removed before it created more damage. Owners consented. Ripley was sedated in order for a thorough oral exam to be performed. The string attached to the eye of the needle was observed extending down into the esophagus and the needle was imbedded in the base of the tongue. The needle was able to be grasped with a surgical utensil and removed with no complication. Ripley was a very lucky dog in that the needle was stuck in her tongue. If the needle had made it further down her intestinal tract, it could have caused a perforation in her bowels and resulted in much more severe consequences. Therefore, it is important to make sure your pets, whether they are young or old, do not have access to foreign bodies of any type, especially those that are sharp.